My interest in cake decorating and sugar craft started thirty-two years ago although I think the seeds were planted much earlier, as my grandfather was a baker by trade and I had grown up watching him creating his daily bakes, which inspired a spark within. 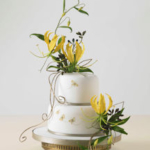 Initially I taught myself from Australian cake decorating books and then attended several sugar flower classes. 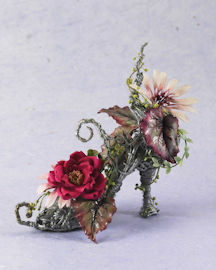 It was during those early classes that my tutor Margaret Morland, the secretary of the Northumbria branch of the guild, introduced me to The British Sugarcraft Guild. Leaving school at aged 16, I went on to study as a full time Bakery/Confectionery student at The City and Guilds Bakery and Flour Confectionery 120 and 121. 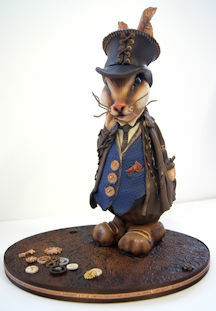 Just turned 17, I gave my very first demonstration to the Whickham and Gateshead Branch of The British Sugarcraft Guild. I soon realized that I enjoyed demonstrating and teaching as much as the craft itself and it was not long before the word had spread around the country to other branches of the guild where I was fortunate to be invited to share my skills. In this time frame I trained to become an accredited demonstrator for the guild. Coincidentally I was lucky enough to attend a class by Tombi Peck, a founder member of the Guild and author of one of the books I had used to teach myself. After attending several of Tombi’s classes, we gradually became great friends. 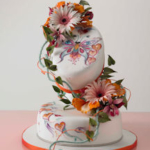 Fast forward to the present, I have written 13 books on the art of sugar flower making and cake decoration as well as co-authoring three additional books with Tombi Peck and Tony Warren. 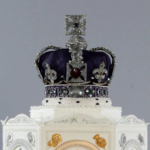 Numerous articles on cake artistry have been created over a span of decades and published in the British Sugarcraft Guild newsletter and the following magazines: Cakes and Sugarcraft, Cake Decoration Monthly, American Cake Decorating and Cake Masters Magazine. I also contributed two projects to Squires Kitchen School book (published March 2014). 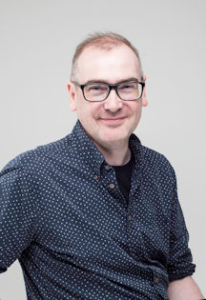 My teaching commissions have spanned the globe; domestically throughout the U.K and internationally the United States, Canada, Japan, Holland, Sweden, Denmark, The Channel Islands, Brazil, South Africa, Australia, New Zealand, Malaysia, South Korea, Spain, Russia, Bulgaria, Italy, India, Philippines, Taiwan, Switzerland, Germany and Portugal. On a personal level my showpieces can often be seen displayed on the Table of Honor at prestigious sugar craft exhibitions. 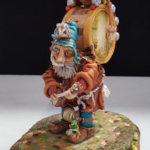 Recognized as an accredited judge, I have adjudicated for the British Sugarcraft Guild, Squires Kitchen and Cake Masters cake competitive events. 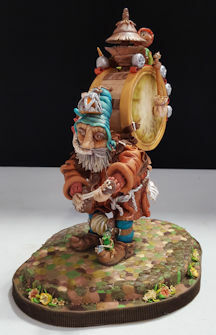 Awards include the Oklahoma State Sugar Art Show Medal of Honour and multiple Best of Show and blue ribbons in competition. 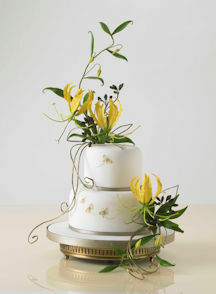 On the small screen, I host two online tutorials with Craftsy.com, the first Tropical Sugar Flowers and second Sugar Flowers – Off the Garden Path. 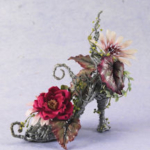 Find me online at http://alandunnsugarcraft.co.uk. 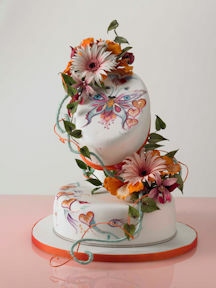 Jacqui is the founder of Totally Sugar, a London-based sugar studio specializing in bespoke edible art. 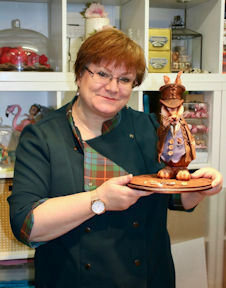 With her bubbly personality and delightful Scottish accent, she is a pastry chef, cake decorator, multi-gold medal winning sugar artist, and Best in Show at Cake International 2014 in London. Kelly’s work, be it larger than life or in miniature, is renowned for its incredible attention to detail and hyper-realism. Having been told not to play with her food, Jacqui now makes it her life’s work to confuse and delight all the senses, using food as an artistic medium. Her irrepressible flair and high impact works of art are designed to get people talking. 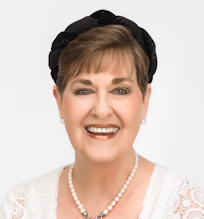 Jacqui Kelly has an impressive client list including Harrods, HRH Queen Elizabeth II, large corporations, and the couple next door. You name it, she has delivered it — amazing sugar creations, impressing them all. Proud to be the team leader for the current holders of the Guinness Book of World Records, she contributed to the world’s largest cake, a whopping 10 m by 12 m.
Although Jacqui accepts personal commissions for clients, her other great love is teaching and demonstrating the skills of cake decoration and sugar craft. This medium has opened the door for Jacqui to travel worldwide, sharing her technical skills and expertise. Her work has appeared in numerous international publications. 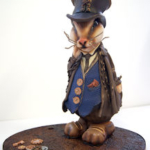 In 2017 she won a Top 10 International Sugar Artist Award at the New York Cake Show, and in 2018 she won the prestigious title of Professional Cake Decorator of the Year at Salon Culinaire Hotelympia.